VATICAN CITY (CNS) — The Vatican is studying the possibility of Pope Francis visiting Armenia in late June, the Vatican spokesman said. Jesuit Father Federico Lombardi, the spokesman, confirming Pope Francis’ desire to make the trip, denied that it already was set for June 22-26 as a news website reported. 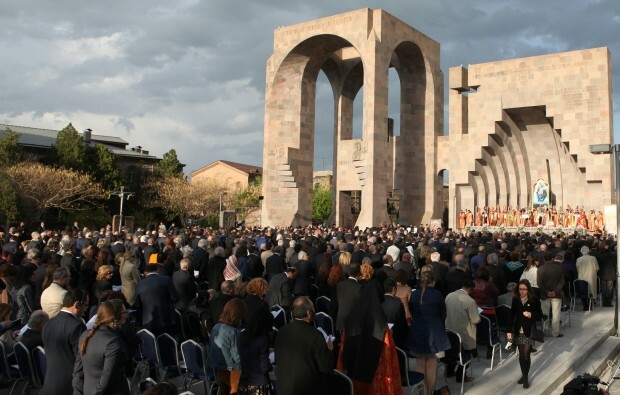 “It is true that a trip to Armenia in late June is being studied,” he said March 18, but the papal trip planners had not yet visited the country and neither the dates nor the program have been finalized. The vast majority of the residents of Armenia — some 92 percent — belong to the Armenian Apostolic Church, one of the Oriental Orthodox churches. Of the country’s 3 million inhabitants, the Vatican says about 280,000 are Catholic, belonging either to the Latin-rite or to the Armenian Catholic Church, an Eastern church in full communion with Rome. In April 2015, Pope Francis proclaimed a 10th-century Armenian monk, St. Gregory of Narek, a doctor of the church. The proclamation took place during a liturgy the pope concelebrated with leaders of the Armenian Catholic patriarchate, which is based in Lebanon. The visit to Armenia would come just four months after the Vatican and Turkey resolved diplomatic tensions that followed Pope Francis’ April 2015 use of the term “genocide” in reference to the deaths of an estimated 1.5 million Armenians during their forced evacuation by Ottoman Turks in 1915-18. Turkey rejects accusations of genocide and disputes the number of Armenians who died. St. John Paul II visited Armenia in 2001.